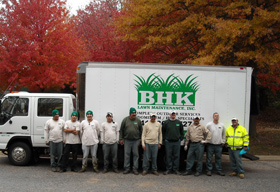 With a combined 75+ years of field experience, the professionals at BHK Lawn Maintenance, Inc. are specialists in the design and care of beautiful lawns and pleasing landscaping. We have a comprehensive knowledge of plants, lawn products, and maintenance strategies, and we can help you keep a healthy property year round. SIMA is a nonprofit trade association that exists to ensure professionalism and safer communities by helping those who manage snow and ice master essential skills and practices.